Yes, it’s paper mache. Wow. The work is by artist Hazel Bryce, who lives in Reading, UK. Hazel recently completed a new video showing her paper mache seahorse, which you can see below. She also has a number of close-up photos on her website, and photos of her other work. 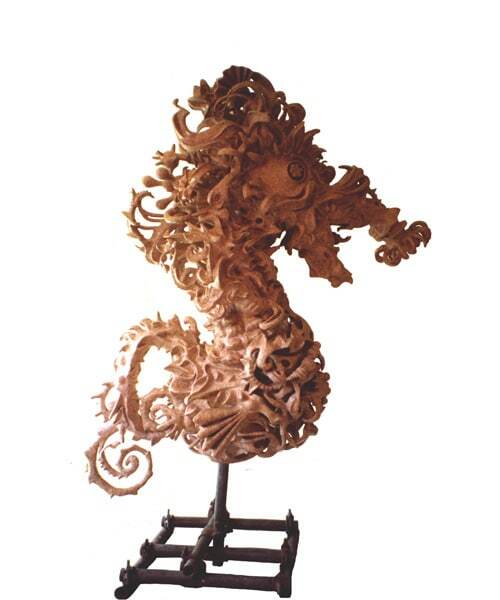 According to Hazel, the seahorse has been shown at the Royal Academy of Arts London and is currently on exhibition at a Paper museum in the Czech Republic. However, this beautiful piece needs a new home by May 2012. If you have any ideas about where the piece should be exhibited next, Hazel would love to hear from you. Did u plan for it to staNd or hang?what do u recommend.? This is a really old post and I doubt that Hazel is still watching for comments. You might want to do a Google search for Hazel Bryce to see if she has a Facebook page. P.S. your site has given me a whole new lease on life, seriously, it’s that inspirational! Hi Dorothy. I’m glad you’re enjoying the site. Thanks for your kind words. just tried to view the video here about hte sea horse and it says on it “video is private”. so it cant be viewed anymore or they made this site private. darn it..
Dang – thanks for letting me know. I removed the link to the video. I do not have a bread dough hook attachment so my paper clay was a bit more lumpy than I would have liked. Reading something about plastic wrap on this web site, I used a plastic “sandwich bag” as a mitt . I gentle gave the wet surface a pushing and circular massage, and the surface became a great deal smoother. Hazel, you have a gift of artistry that is rarely seen. You are a genius and do not let anybody dictate how to represent who you are as an artist. I know you can make pieces that can and will rival the seahorse. This seahorse is a gem and I am sure that it will find a very good home. Your expression is all your own. You have a big fan in me. Hazel…I must say when I saw your Seahorse I thought how beautiful! You have such patience and it shows.